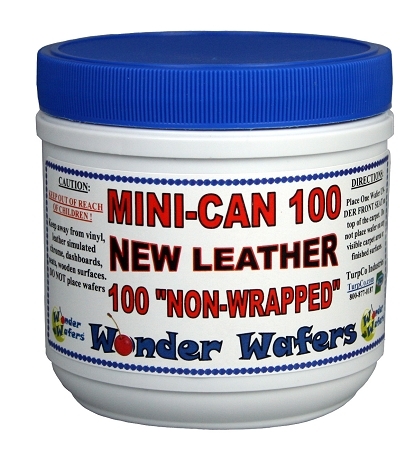 The Mini-Can 100 Consists of 100 “NON-WRAPPED” Wonder Wafers That are Factory Fresh "Packed and Sealed" in a Convenient Easy To Use Canister. Available in 14 High Quality Fragrances. The Mini-Can 100 Has A Twist On / Twist Off Air Tight Lid That Assures Factory Freshness Day After Day. 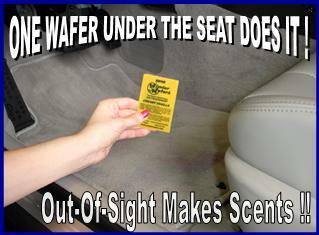 Wonder Wafers Out Preform All Other Air Fresheners. OVER ONE BILLION WONDER WAFERS SOLD WORLDWIDE...! Wonder Wafers Are Great ! Thanks again, those things are wonderful make my whole closet smell like new shoes!!! Me and my staff like your mini can of wonder wafers also my Clients love them I have been using them for years I've been buying 4 cans of the 250 wander wafers but in some case it's hard when you don't have space in your vehicle so Thanks for those mini-Cans I will keep ordering them every time I get low on the product and delivery was fast and on time. 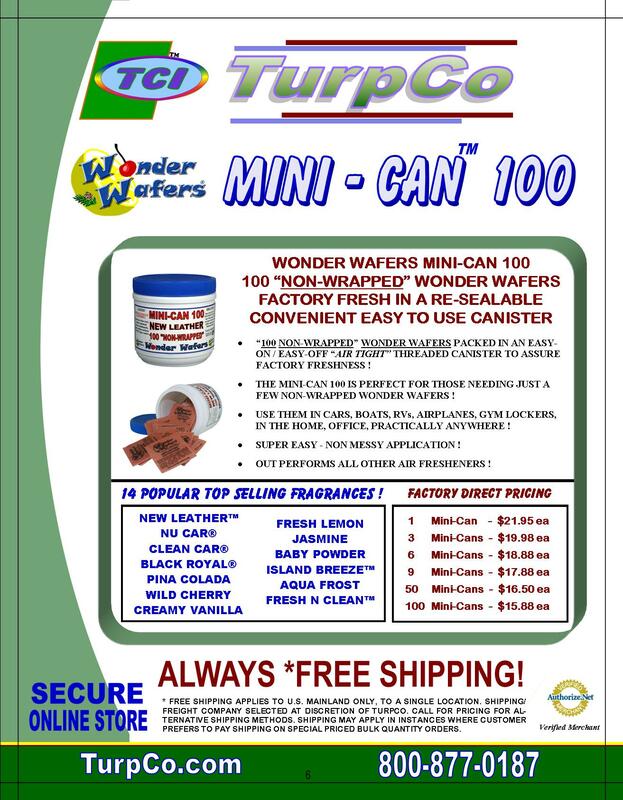 Q: Is the Wonder Wafers Mini-Can 100 available in the Pine scent? 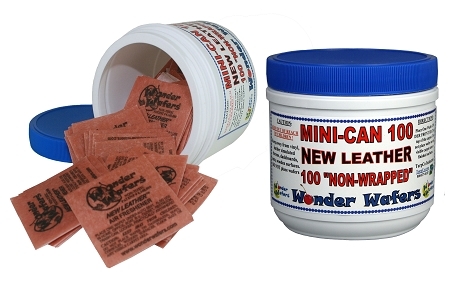 A: The Mini-Can 100 currently doesn't come in Pine scent, however, for larger quantities (minimum order of 10) we can have Pine available for you, or any of the other 18 remaining Wonder Wafers fragrances. Just contact sales@turpco.com for more information. Q: I accidently left the lid off for a few days, and the Wonder Wafers aren't as strong now. What can I Do? A: It's important to tighten the lid after each use. 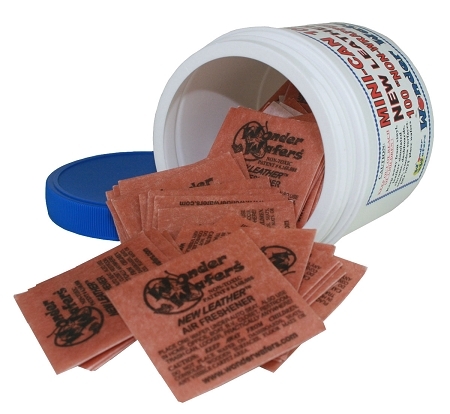 If for some reason the lid is left off for a period of time, the Wonder Wafers' aroma will activate (atomize) as they are designed to do when exposed to ambient air. When this happens, some customers purchase our Insta-Scent Ultra, or Insta-Scent Mist to rejuvenate the Wafers. This can be done by adding an oz or two (depending on the number of Wonder Wafers) to the canister, closing the lid and shaking them a bit. then letting them set until they absorb the liquid. Q: I want to buy blue color. How to buy blue one? A: The blue one you're asking about is probably the "Clean Car" fragrance. The "Clean Car" wonder wafers are blue. Q: I want to buy green color one. Pls, let me know how? A: The green colored ones are either "Fresh N Clean", or "Jasmine". If you have one of the green wonder wafers, the fragrance name is printed on it. Q: Can I buy 3 fragrances in one can? Island breeze 50, fresh N clean 25, fresh lemon 25? And even though this is non wrapped can, can you pack three different zip bag to prevent from mixing each other? A: Sorry, but we don't have pricing or the product code required to process that request. Also, unwrapped wafers don't react well to thin zip bags. The ideal product for you may be our Build Your Own Variety Pak. This product allows you to mix and match the amount of each fragrances you want, and there are more available fragrances. The "Build Your Own Variety Paks" are individually wrapped wonder wafers that you can store together without cross contamination. No minimum quantity is required, you can mix and match as few or as many as you like.